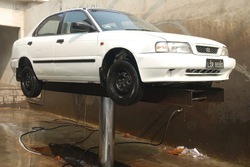 Owing to our rich industry experience, we indulge in manufacturing and supplying an outstanding Car Washing Lift. 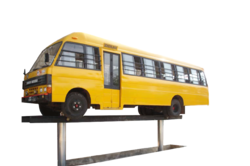 Designed and manufactured in compliance with international standards, this very product is a delight for clients. 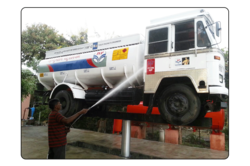 We are engaged in manufacturing and supplying Hydraulic Servicing Jack. 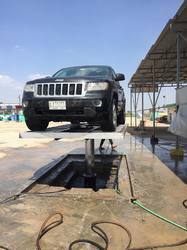 Hydraulic Servicing Jack has the capacity to handle all types of vehicles including Cars, Jeeps, Vans, LCVs and Heavy Trucks and Buses. The products we offer are manufactured using quality tested raw material under the guidance of our reliable engineers. 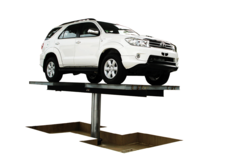 Hoists can be custom built to suit consumer. Plungers are made of high grade steel, ground to close tolerance and hard chrome plated for high wear resistance and excellent surface finish. Packaging Details: Wooden Crates and Boxes . 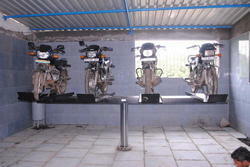 Two wheeler washing lift provides smart way to wash two-wheelers. 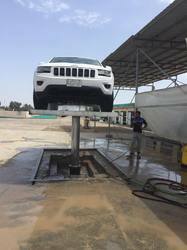 This system is designed to wash four vehicles at a time resulting in saving of time and water. This installation will support both indoor & outdoor operation. Uniquely designed wiper rings to prevent entry of water and dirt particles into the hoist cylinder while raising, servicing and lowering. High-grade steel plungers manufactured to close tolerance with hard chrome plating for high wear-resistance. No. of Plunger 1 No. Max. 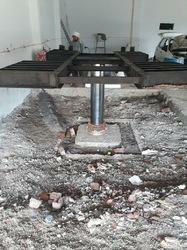 Lifting Height 1450 mm.